Abdullahi An-Na’im is this year's recipient of Emory's Scholar/Teacher Award. Emory Photo/Video. Abdullahi An-Na’im’s commitment to the well-being of the wider world began early in his career as scholar, teacher and human rights activist. 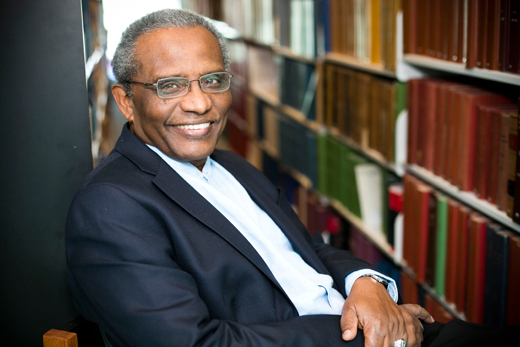 An-Na’im, Charles Howard Candler Professor of Law at Emory, credits the late Islamic reformer, activist and fellow Sudan native Mahmoud Mohamed Taha with changing his life forever. "Taha called for a fresh reinterpretation of Sharia (Islamic law) in light of the drastically transformed present context of Muslim societies today, to ensure equality for all men and women, without any distinction and other objectives," says An-Na’im, who as a young law student at the University of Khartoum in the late 1960s joined Taha’s reform movement. Tragically, Taha was convicted of apostasy and sentenced to death in 1985. "I left Sudan in April of that year," says An-Na’im, "reeling from the profound shock that my mentor had been publicly executed, his books were burned, and the Islamic reform movement he founded in 1951 had been banned." As An-Na’im remembers it, Taha enabled him to confront and overcome "the contradiction between my belief as a Muslim that Sharia was divine and immutable, and my personal commitment to constitutional governance and respect for human rights." An-Na’im dedicated himself to reconciling his Islamic faith and identity with his commitment to universal acceptance of and response for human rights. It is a quest that has taken him from the classroom to all corners of the world, inspiring colleagues and students, and ultimately generating the kinds of changes that Taha challenged him to work toward. This is among the reasons An-Na’im has been named the 2014 recipient of Emory’s Scholar/Teacher Award. The award is given on behalf of the United Methodist Church Board of Higher Education and Ministry to an Emory faculty member who has demonstrated exceptional teaching, concern for students and colleagues, and made significant contributions to the scholarly life of the university. An-Na’im’s latest book, "What is an American Muslim? Embracing Faith and Citizenship" (Oxford University Press, 2014) is perhaps his most personal, an application of his wide expertise in and deep commitment to the positive evolution of law, religion and human rights in an often divisive and flawed world. The book offers an argument for a secular state in which Muslims can be fully Muslim and fully American. He urges American Muslims to engage in the civil and political life of the country as citizens informed by their faith, rather than a community separated by religion. One story that represents An-Na’im’s commitment to the free exercise of faith within the larger community concerns one of his former students. She asked An-Na’im to visit her family to help resolve a crisis by explaining how Sharia would permit marriage of a Muslim woman to a Christian man. Having equipped himself with the relevant verses of the Quran and explaining his view to the family, An-Na’im "happily guided the couple through the formation of a marriage contract on the spot, which is all it takes to constitute a valid marriage under Sharia." "The response of that family is not blind concession to modernization or dominant culture," he says, "but a living embodiment of the historical dynamism and adaptability of Sharia." "What makes the United States an excellent place to be a Muslim is the unique combination of freedom of religion and freedom from religion," he says, "because a religion coercively enforced by the state is not the religion of any believer." A law school faculty member since 1995, An-Na’im serves as a senior fellow in the Center for the Study of Law and Religion, associated professor in Emory College of Arts and Sciences, faculty fellow of Emory Center for Ethics, and director of Emory Law’s Center for International and Comparative Law. A prolific scholar, he is the author of six books, editor and co-editor of 10 books, and author of more than 60 articles and book chapters. His research has been wide ranging and international, from the study of women’s access to and control of land in seven African countries to a global study of Islamic family law, to a fellowship program in Islam and human rights.